The internet has a fetish for fried food. Actually, scratch that. America has a fetish for fried food. So, if you're gonna dive right in that vat of oil, why not dive deep. Like calories and calories and calories deep. Just when you thought cheesecake couldn't be any worse for you! In a medium bowl, combine cracker crumbs, sugar, and melted butter. Press firmly on bottom and 1-inch up sides of a 9-inch spring form pan. Bake 8 minutes. Step 3 Make the batter. In a large bowl, combine cream cheese and sugar. Beat with an electric mixer until fluffy. Beat in eggs, 1 at a time, beating well after each addition. Stir in melted chocolate. Step 4 Bake and cool. Carefully pour batter into the prepared crust. Bake 45 minutes. Then let cool completely on wire rack. Chill 8 hours before serving to set. Cut the cheesecake into approximately 3 by 1-inch uniform pieces. Heat oil in deep-fryer to 365 degrees F. Lightly moisten each spring roll wrapper with the egg wash. Blot off excess egg wash with paper towels. Place each piece of cheesecake in the middle of a wrapper. Sprinkle with the chopped chocolate. Fold top of wrapper down over the cheesecake, and both sides toward the middle. Roll each piece of cheesecake toward you until it is completely rolled up. Make sure the egg roll is tightly packed with its edges sealed. Gently release egg rolls into the oil and cook until golden brown, roughly 2 minutes. Using tongs remove the golden-brown egg rolls from the oil. Place each egg roll in a bowl of powdered sugar and coat well. 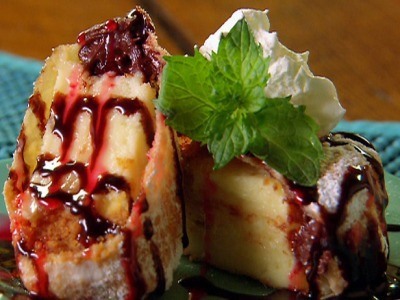 Place deep-fried rolls of cheesecake on paper towels to cool slightly before serving. Drizzle with chocolate sauce and top with whipped cream. I can feel a heart attack coming on just reading this. AMERICA FRIKKIN ROCKS. 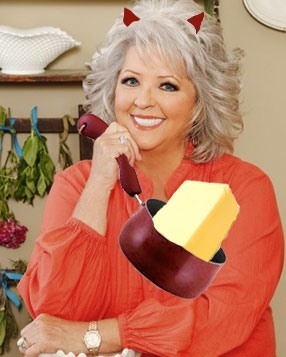 We fry everything, we cake our arteries with deliciousness. Is that the woman whose husband looks like santa claus?